Why? asks a bewildered nation. Read on… We were very disturbed by the recent Vision Critical survey that suggests contemporary children have no idea who Shakespeare is and that more than a quarter of adults haven’t read his plays. And as for the final kick in the codpiece that nobody even knows Shakespeare was British? We blame ourselves. Ever since the three American lads of the Reduced Shakespeare Company concocted The Complete Works of William Shakespeare (abridged), the play has been such a massive global phenomenon that most people quite rightly assume Shakespeare was American. (We thought so too.) After all, Shakespeare is the most produced playwright in any language in any country. He’s everywhere, on every continent. He’s like the American military or Katy Perry, but with fewer guns or firework-shooting bras. But we must also lay the blame for Shakespeare’s declining popularity and awareness where it most belongs — on William Shakespeare himself. His language is archaic: People just don’t talk like that, innit? His comedies aren’t as funny as his tragedies. And he didn’t leave a paper trail: There are no original copies of the plays written in his own hand, there are no books from his library with his notes in the margins, and worst of all, there are no scandalous diary entries from which enterprising television producers can concoct reality shows like The Real Merry Housewives of Windsor. But have no fear! There are Shakespeare’s magnificent plays themselves, thirty-seven gloriously overlong epics which the Reduced Shakespeare Company have helpfully shrunk down to a manageable size. 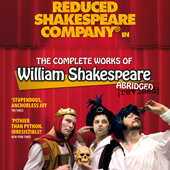 The Bad Boys of Abridgment return to the UK in Spring 2013 to unleash their comic heresy The Complete Works of William Shakespeare (abridged) in a newly revised and updated edition on an unsuspecting (and clearly ignorant) British public. Critics have described the show as “Gloriously, relaxingly funny” (Financial Times), “The funniest show you are likely to see in your entire lifetime” (Montreal Gazette), and “a monstrous impertinence” (Shakespeare’s Mum). The RSC (that’s the Reduced Shakespeare Company, not that other RSC that stole our initials) will take you on a roller-coaster ride through all thirty-seven of Shakespeare’s plays in under two hours. You’ll laugh, you’ll cry, you’ll kiss good money goodbye. And you’ll leave the theatre knowing William Shakespeare was, without a doubt, the greatest British playwright of all time. Only a Brit could survive what we cheeky Americans are doing to him. One final word. There is apparently another survey out there indicating approximately nine percent of the British public believe they actually are William Shakespeare. We can’t help you with that. That’s on you. Check out the 2013 UK Tour Dates here!